Since when did Hanuman and Yamuna ever get related? .... A faint question mark remained in the back of the mind even as I was doing my research for the maiden trip to Yamunotri. I do claim of a better than average understanding of Hindu mythology but nowhere have I ever come across anything linking Hanuman and Yamuna!! Why is the first point of trek called Hanumanchatti? Why is the river flowing by there, a tributary to Yamuna, called Hanuman Ganga? Why is the temple there is that of Hanumaneshwar Mahadev? Usually one finds a story around everything in the Himalayas and I was eager to discover the one here. I had my maiden voyage to the source of Ganga that year and was getting ever fascinated with the Headwaters of our revered River Goddesses, purely from a trekker’s standpoint. I believe now, there are strong physical and geographical reasons as to why certain places in the mountains are worshipped and raised to that divine status and others are not! In the midst of Himadris at Gangotri one would find the most amazing gorges and at Gaumukh, that amazing amphitheatre of peaks. At Badrinath..you have that most comforting and convenient hot spring – Taptakund- right under the temple, ensconced beautifully at the feet of the mighty Nilkanth. Kedarnath- that massive wall of Mt Kedarnath overlooking the temple that houses the huge Swayamvu Lingam, Roopkund with its morbid story of skeletons of people and horses, The Panchakedars and Panch Badris all nestled in places geographically significant adds to the aura of the intriguing mystery of “Devbhoomi”. Its later that I discovered, how important a role this tempestuous River Mother – Yamuna played in shaping a great civilisation... if I may add, a refreshing and reflective personal discovery. In the monsoons of 2001, we planned that trip as the worthy sequel to our Gaumukh Darshan, a pilgrimage to the source of the second most important river that emerges from the Garhwal Mountains. We planned to trek all the way to Saptarishi Kund which is said to be the real source of Yamuna. Actually Yamuna is a raging torrent at Yamunotri Temple coming from somewhere up there from the mountains up north from its source at the sacred Kund at the feet of the Champasar Glacier. Not much information was available on the Internet. We just knew that its 8 Kms from the temple and thus the route was planned. The itinerary changed during the trip and our Day 2 camp was 600 Mtrs above Yamunotri. I had the fastest descent of my life the next day, trekked in total darkness on the edges of terrifying gorges and Bunty continued his jinx of stopping short of the summit. I came back; ebullient with the joy of adventure and enriched with a very different perspective and understanding of the King of the Mountains. The usual early morning dash to the mountains was rendered memorable by pretty sights of Mussorie and “Kempty Falls” afterwards. I had never seen Mussorie till then, but the brief glimpse of it compelled me to come back several times in later years to witness for myself, what Ruskin Bond describes so beautifully in many of his works. Later, the road to Yamunotri turned left after the Yamuna Bridge. The winding roads passing thru verdant rain-soaked fields soon brought us to Barkot where we stopped for lunch. My Father, Bunty and I were having a great morning drive till then which was about to change quite suddenly. Just when we were having our lunch by the roadside Dhaba we overheard conversations indicating that the route ahead was closed! We enquired and had sketchy descriptions about the fact that the road was closed for traffic about 30 Kms up from Barkot. Nevertheless we decided to take a chance and drove on. Exactly after 30 Kms we saw the serpentine queue of vehicles and people milling around a distant bridge. What we saw at the centre of all commotion was something which I had never seen till then. A freak cloudburst has brought a whole mountainside down onto the Yamuna and a natural dam had got created with the water levels almost touching the base of the bridge that spanned the river. Not only that, the gushing torrent of water escaping the natural dam had eaten into 50% of the road stopping all traffic! There was no way anybody could get a 4 wheeler to the other side of that stretch. Very gracefully we decided to get the car back to Barkot and take help of local taxis that were plying from the respective ends of the roadblock. My poor father volunteered to ferry all the luggage across the stretch in the meantime. Couple of hours later we were back at the same point having spent some agonising moments in the most rickety Jeep that I have ever ridden in my lifetime! As we drove up to Hanumanchatti I was reflecting on the stark difference between the two mighty rivers of Northern India. While the gentle, soothing and fair Ganga would flow through a wide and majestic valley, the Yamuna is ever so dark and rapid flowing through awe inspiring depths! She was the sister of Yama, the God of Death, the Lord of the dark netherworlds. The evening was cold at the huge GMVN guesthouse to the constant accompaniment of the deep sound of the Hanumanganga confluencing with the dancing Yamuna barely a 200 meters to the North. The Hanumaneswar Mahadev temple overlooked the confluence. Late in the night, around the campfire we got to know the story of Hanuman and Yamuna. It was at the site of the Hanumaneswar Mahadev temple that "Kalanemi", the uncle of Ravana had his hermitage. When Hanuman arrived there in search of the medicinal mountain, Kalanemi lured him into a trap by asking him to take a bath in the crocodile infested river nearby. But Hanuman soon had the better of the crocodile and tore it into two pieces, thus liberating the Apsara that was trapped in that body. Soon thereafter Kalanemi was also despatched to the heavens by Hanuman. This little story is still inscribed on the temple walls at Hanumanchatti even today. The next day opened bright and clear. We had collected sufficient intelligence on the route ahead, the previous night. We had to drive on hired Jeep till Naradchatti and start trekking from there on...mules could be arranged for Baba. Yamunotri was a good 12 Kms away. The route winded up and down along the banks of Yamuna who refused to come above her meandering depths. Soon we were able to see a hanging glacier, which we assumed to be atop the Yamunotri area... one which resembled an elephant’s head. After crossing the river over a bridge (above which a new bridge was getting constructed) we reached Janakichatti and sat down for a well deserved rest. A lanky lad, in his early twenties presented himself and offered to be our guide for the Saptarishi Kund trail. Swarup Lal, that was his name, claimed to have visited the area several times for his own work. He also managed to procure the services of a cheerful Nepali fella- Dhaniram. The team size enlarged by 2 men and we proceeded on to the sharply switching bends above Janakichatti. The trail looked to be moving heavenwards forever, at least for the next one hour! Just when we were about to reach the top of this sharp ascent we saw a gentleman sitting on the ground, in pain, with a group of his friends and relatives tending to him. Apparently he was riding a pony and fell backwards on his head loosing balance in that sharp gradient. I remembered why ponywallahs always ask you to lean forward during an ascent and lean backwards during sharp descents. Right after this sharp climb the route levels out onto the precipitous sides of a deep gorge. Hundreds of feet below, the snaking Yamuna thunders along. The vast vertical sidewalls of the gorge were dotted with several little waterfalls that mist down the depths and join the tempestuous currents of the Yamuna. That hour of the track is harassing, to say the least, for all who would not have a good head for heights. The route however is secured with iron railings on the sides, for the route sees such a heavy traffic of pilgrims every season. Now and then one would see mangled remains of these railings – signs of the powerful avalanches that would have shown their fury during the winter snows. “Woh route hai Bali Pass ke liye”..Swarup Lal informed. It took me 6 more years to come back there and attempt the route to Bali Pass, though my mind was set upon that trek that day onwards. My father had overtaken us on his pony and gone ahead. By the time we reached Yamunotri he was waiting for us at the entrance to the lane that leads to the temple. He had finished his Darshan and offered us some Prasad. It was already 1200 and we decided to bypass the temple Darshan(Perhaps that’s the mistake I did.. as I would realise later). It was decided that Baba would go back to Hanumanchatti and wait for us while we would do Saptarishi Kund and come back the following day. Off we went crossing the bridge at Yamunotri that led us to a route that flanked and went up the hill side to the true left of the main Yamuna Stream (alongside which the temple is located). As the foret cover thickened so did a faint aroma in the air. Just then Swarup Lal stopped dead on the track, looked deep into the shrub cover to the left with absolute focus, grabbed a shrub and yanked it off with its root intact. “Iska Jad ko soongh ke dekhiye Saab.” He was making me smell the root and it had this strong smell of some pain balm. “Bas iska Chai banaiye aur Sardi Khansi khatam”.. He was describing the medicinal characteristic of the root that would beat the sales pitch of any medicine representative. In the next one hour he showed us some 10 different flowers and roots each having a different medicinal characteristic. One was genuinely surprised with his acute knowledge of Flora in that area. “Isko Mat chhuna! Bahut zehreela hai yeh. Cyanide jitna. Isko Cyanide flower kehte hain. Agar kha liya to ek raat me kaam tamaam ho jayega” Swarup Lal was chirping along pointing at a flower which was probably the prettiest with the brightest of shades of pastel. Swarup hailed from Kharsali village which is just opposite Janakichatti across the river. Apparntly a good many number of people from their village earned their livelihood by collecting these exotic herbs and selling them to drug companies that come shopping for these from the mainland plains of Northern India. That explained the amazing repository of botanical information that simple people like Swarup Lal possessed. “Kasturi Mara!! Koi local shikari hai” exclaimed Swarup Lal. “Haan muskdeer, Kasturi-mrig kehte hum gaon me. Bahut hain is jungle mein”. Swarup informed quite matter-of-factly. Apparently the forest had its population of muskdeers which get abundantly poached by local hunters. I was getting more and more enthralled every moment as the true beauty of the flora and fauna in this majestic mountain unfolded. It was as if one was in magic land.. lush green hillside dotted with a zillion flowers, the smell so very exotic, the eagerness of sighting a muskdeer or beer, the silvery drape of snow over the shoulders of distant mountains and the rolling clouds on the horizon!! Wouldn’t one die to have that all freeze-framed? “Aaj zyda ooper nahin jayenge. Jungle aur Paani ke paas hi camp lagate hain” opined Swarup. He was against camping anywhere high up and promised us a camping ground soon, which I was doubting of course looking at the angle of incline of the valley. “Won raha campsite” He was pointing at a little clearing over a spur that jutted out of the valley side between two swiftly flowing waterfalls and dropped sharply down. The said campsite was on top of this spur providing a clearing, barely 150 feet long and 20 feet wide. But to our tired limbs it looked inviting enough and we set up our little Alpine tent there. A campfire was setup in no time over which the dinner was cooked for the night. “Yahin to aaye the Hanuman Ramayan ke time me. Sanjeevani booti issi pahad mein hai. Abhi bhi hai" Swarup was back to his unending stories even as the dinner was getting cooked. We had agreed on starting early the next day in order to beat the afternoon drizzle. But Bunty refused to budge when I tried waking him up the next morning. Apparently his head was feeling heavy and however much I would try to reason with him he simply refused to get up. I didn’t force much thinking he had been hit by AMS and his physical defences were up. So I decided to leave Bunty as camp guard and proceeded forth with both Swarup and Dhaniram to help me. If Bunty would have been ready, Dhaniram would have been the camp guard. Hard Luck! The track soon winded upwards and brought us to a shepherd hut. Clouds were rolling in and it had begun to drizzle very lightly. The route now formed into sharp switchbacks leading forever upwards. There were probably 15 switchbacks in total and we were up by some 300 mtrs by the time we finished with them. All along Swarup had been pointing out the various Aromatic herbs like Google, Punja, Lemon Grass and Brahmkamal. While Google, Punja and Lemon Grass had therapeutic usage, Brahmkamals served a more religious purpose. It’s basically good omen to find Brahmkamals in full bloom. They are the most precious floral offerings in the temples of Garhwal- for these are flowers one finds only between altitudes of 4000-4500 Mtrs and thus indicate the labours involved in obtaining them. There were Phen Kamals as well which had coagulating, antiseptic and healing properties. Phen Kamals can be seen at even higher altitudes growing even on scree and morraine slopes. Dhaniram and Swarup picked up clumps of Google herb and Lemon Grass as tokens of gifts for the Babaji who lived at Yamunotri. I admired the absolute devotion in Swarup and Dhaniram as they collected herbs for their Babaji. The track then headed East (All along till then we were going west!) and entered a wide high valley indicating the final approach to the Kund. A near vertical wall with fairly brittle rock presented as obstacle settled over a mound of scree. Both Swarup and Dhani guided me above with indulgent care. There were places where we were hanging on to vertical walls with mere finger-holds. Luckily this ordeal lasted for about 15 minutes only and we walked up the final ridge to a depression beyond where few Cairns and a fluttering red flag announced the location of Saptarishi Kund. A faint and silent stream of water flowed from the South-East corner... the source waters of the mighty Yamuna! 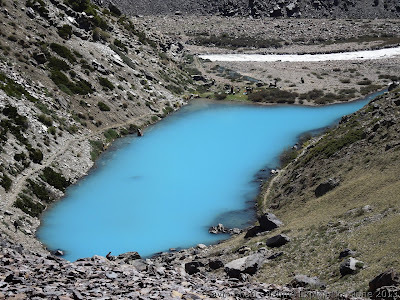 There are in fact two glacial ponds there, I am not sure if they are interconnected. Towards the North East was a Pass which led to the higher plateau of the Banderpunch glacier. The place had a eerie feel.. we felt as if we had intruded upon the space of sacred and silent meditation ground. There were wisps of clouds hanging all around and we were getting progressively wetter with the frozen mist of a drizzle. The sky was overcast threatening to pour down any minute which prompted us to hasten our retreat after some quick photo-shoot. I do not remember for sure if it was the excitement of adventure or the fear of impending rains that prompted me to do what I did for which the mountains taught me a lesson that shall never be forgotton in my living memory. I sped my way down!! In fact I was hopping over boulders, taking shortcuts over the switch backs, jumping over the bushes slipping occasionally but essentially speeding down the track to the spur camp. It must have been barely 30 minutes and some 2 kilometers down that the numbing cramps gripped my thighs and knees ..somewhere in the middle of the switch-backs. Within barely 5 minutes I became a limping wreck of a trekker. In spite of the support of the metal tipped walking stick, each step now became agonisingly painful. It was almost as if I was walking on some short stilt, unable to bend any part of my leg. That’s when I learnt the importance of the extreme care that must be exercised while coming down a steep descent. I was learning the cardinal rules of high altitude hike- Be doubly careful while coming down the same steep slope which you climbed earlier with so much ease. Never take the impact of descent on the knee joints; use the thigh muscles, take support of the trekking pole and take the brunt of the impact on the waist! "Sir Pahari aurat kaise load sar pe le kar slopes se utarte hain ? Waise chalo... thoda ajeeb lagega lekin cramps nahin hoga"- Harveer Panwar taught me this a year later when we were hurtling ourselves down the Tapovan banks. The agony continued and we finally reached camp after 2 hours to be welcomed by a thoroughly exasperated Bunty, who was by then regretting his morning laziness and had explored all little peaks, mounds and spurs in that area around the camp. His jinx of stopping short of the summit continued. I do respect the cheerful countenance that he did wear afterwards trying to get over the disappointment by taking on the task of guiding his injured brother back to safety. He took over the load of my rucksack and would lend me a constant helping hand to aid the descent to Yamunotri. We had, by then, decided to take a pony from Yamunotri for I was in no condition to walk that entire distance. By 1800 Hrs we reached Yamunotri and managed to catch one last Ponywallah and a porter to help us reach back to Hanumanchatti. Soon the sun set and the darkness of the night engulfed the environs. There was no moon in the sky and even the stars had stopped twinkling. We were making extremely slow progress through that difficult terrain, heart pounding with anxiety of facing imminent danger. We had been to Yamunotri and failed to pay obeisance to Mother Yamuna. “Its her wrath “ I thought and cursed myself for having not done the Puja in the temple on the way up. After a gruelling 3 hours from Yamunotri we finally covered the distance to Naradchatti from where we got a short Jeep ride back to Hanumanchatti. The ponywallah and the porter insisted on taking the torch to guide their way back home instead of a tip in cash. Obviously reaching back home safely was more important to them compared to any cash reward! Thus ended the second day full of adventure. The pain was gone in surprising promptness once I had taken a pill of Nimusulide. And we slept like logs, resting our limbs for a long drive back to Delhi the next day. Riding back through the mountain roads to Delhi I was still reflecting over the experiences of the past forty eight hours. The Himalayas had shown us a very different aspect of its grandness. Since the time, for as far back as human memory goes, he has provided the much meditative seclusion for the seeker of higher truth, has nourished and nurtured a whole civilisation with its gigantic watershed, has protected whole continent of land from marauding invaders standing the lone sentinel, has held together the most wonderful bouquet of climates that one sees only in this unique land ... and as I now discovered, has even provided for health and wellness with his amazing treasurehouse of medicinal flora! It’s only during my later readings that I discovered that the branch of physical sciences in the Vedic ages actually developed in these mountains. It’s in the laps of these very mountains that the ancient Seers codified the first principles of Ayrurveda and Tantra under the tutelage of the great sage “Maha Atahrvana Javali”. Under its clear starlit skies the ancient astronomer-sages wrote the first verses of Vedic Astrology. Here people studied the effects and causes of the Paranormal. This school of sciences eventually got classified under the Vedic texts and came to be known as “Atharava". This, was later recognised as the The Fourth Veda after much debate and strife with the proponents of the "Trayi Vidya- Rig, Yajuh, Sama" schools of knowledge- that developed in the hermitages on the banks of Ganges. A picture played in the mind- that of a wizened old sage with beards so white and pure, upon whose lap play a bunch of children with utter curiosity and wanton playfullness. Once again my heart filled with gratitude and my head bowed down with reverence and love for this mighty and benevolent “Giver”. As usual a lovely post--excellent narration matched with some mythological anecdotes ! Sorry to view it late...was a bit leaned to work and kids these days..
Best wishes for your next trek.. Beautifully written!...I actually felt like I have visited the place. I also need help to plan this trek in the near future. wonderful ! amazing ! thnx ! Thanks Munish and Prashant for thecompliments. Had not checked the comments moderation section of this blogsite and hence the delay in reply. Thanks for the kind words of encouragement again. Much of the same as above. While looking at pictures of Yamunotri, I had always wondered what lay beyond the temple; now I know much better. Thanks for sharing. Above all, I am beginning to like the introspectional streaks in your narratives :) One that really got me on this blog-entry compares the mood and images of the upper Yamuna valley to that of the Ganga. Kudos. 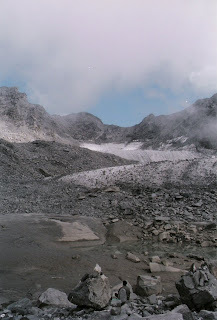 we are also planning to visit saptarishi kund in mid October 2011. Is it doable then?? will there be too much of snow or just cold?? That was a long long time ago Rohan... you can think of hiring a tent from Delhi or somewhere or borrow from someone. A good porter would charge about Rs 400 a day and g good guide should charge about Rs 500 a day. plg the same trek last week April 2012.
by any chance, do u have mobile nos of Swarup Lal and / or Dhaniram of Kharsali? r u likely to have contact nos of any guide at Kharsali for the Saptrshi trek? very delightful sirji! not much has been written on the source of the yamuna n not many pics of saptrishi kund or the champasar glacier! a very thorough n well-written blog.. neat english.. good pics n overall a smooth flow.. just the kind i love.. thanks! Thank you for your informative and inspiring blog on Saptarishi Kund. Their contribution to our culture and well being is immense. They learned it all from Lord Shiva himself. I am planning a pilgrimage to offer my thanks this June. Your information was really helpful. Would it be possible to share the details of the Guide. We would need their help. Also can we get Tent on Rent or do we buy our own. Please advice. You can also email me on roshan.s.thapa@gmail.com. Thank you again for the immense information. this August.we are 5 trekkers. Kindly inform and guide us.